When I was a little girl I adored my daddy. This happy-go-lucky, accordion-playing man who geeked out to Star Trek episodes and Polka cassette tapes was my idol. He played “library” with me, let me give him “makeovers,” and sang me to sleep each night. Letting me ride shotgun every time, he used to take me to the bakery every Saturday to get an iced cookie, then we’d spend the morning running errands together. I saw him as the funniest, friendliest, smartest guy around. During this flashback, an epiphany came to me. I realized why Jesus said we must become like little children to inherit the kingdom of Heaven. When a little girl says she’s going to marry her daddy one day, we generally do not label this declaration as perverse. Rather, we find the innocence of the remark enduring. She simply adores her daddy and speaks out of her innocence. As children, we develop notions about love and life that are left untainted by heartbreak and experience. It is only later that we become a more calloused individual, building defenses around our heart. We barricade ourselves, so it is hard for us to get hurt. In doing this, we keep our souls from being penetrated. And, even with all our knowledge of God- that he will never leave us nor forsake us- we’re afraid to open ourselves up to him. Let them give thanks to the Lord for his unfailing love and his wonderful deeds for men, for he breaks down gates of bronze and cuts through bars of iron. When he pours out his love, the gates and bars over our hearts break. We become as innocent as children again. This is the place when we become free to love God, love others, and love ourselves. 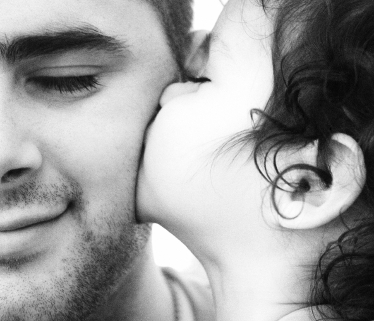 This February is the month of love, but the love of a little girl for her daddy is the purest love of all. It’s innocent, carefree, and contagious. So, let’s all try to be like little children this month and watch our relationship with God grow.